I had a photo posted here and I decided to remove it because I don't want to see it. I hate clowns. They freak me out. So messed up violent people in clown make up is just not an image I want to see when I visit my blog. And this will be my last posting on Juggalos. This is more than enough time and energy into this topic. 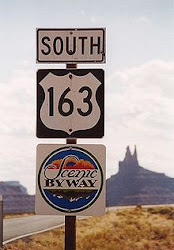 Driving down the Scenic Byway we gotta just keep on moving. I just thought I would share it because it is fascinating to me and it is a piece of Americana now...like it or not.